Gradually, as the workshop took on the aura of hobby heaven, the concept of the kit harpsichord was born. The immediate result was an acoustically successful design that included a first-rate package of materials and instructions capable of meeting with success in unpredictable situations. Such a thing could never have been devised if Frank Hubbard had not already been making first-quality harpsichords. It wasn't too many years before the number of playing Hubbard kits exceeded the number of instruments finished in-shop. Ironically, in the public mind it was these kits that became the face of Hubbard, not the series of particularly fine productions that continued quietly to issue forth from the Hubbard workshop in a series unbroken since Frank Hubbard and William Dowd set up their separate companies. 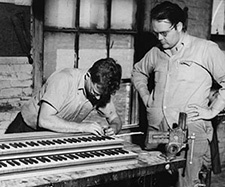 At the time of Frank Hubbard's death in 1976 it had already become clear to Diane Hubbard that the knowledge gained by making finished instruments is absolutely central to each of the company's other facets – the sine qua non. Consequently, the production of custom instruments was carried on. In 1979 I was invited by Diane to return to the firm as Technical Director. Since 1982 all finished instruments have been issued from the shop under the name Hubbard & Broekman. So, who was this upstart, Broekman? While still a music student, I had started my training in harpsichord making in 1965 at the Cannon Guild under Eric Herz. For the rest of the '60's, I continued to work for Eric as my time and studies allowed. Back in New York for lessons and course work, I supported myself as a professional harpsichord tuner and technician. In this endeavor I was able to put to good use much of what I had learned in Boston, for it was at Herz's shop that I learned the basic principles and desiderata governing harpsichord actions. Eric insisted that actions be reliable and work – neither rocket science nor a gimmee but subtle work that demands care and consideration. Finally, in 1969 I decided to take up harpsichord making full-time. Eric, however, ran a ruthlessly efficient, bare-bones shop in which there was not much scope for me to become meaningfully involved in either design or instrument assembly. 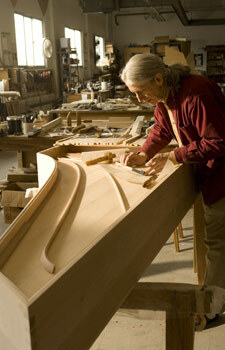 I started at Hubbard in 1970 with the purpose of learning those aspects of the craft. Frank Hubbard occupied the opposite end of the continuum from Eric. By that time Frank had populated his shop with one professional cabinetmaker and an enthusiastic collection of neophyte makers and maker-wannabes, many of whom displayed various florid, (but mercifully temporary) symptoms of 'neat-thing' syndrome. Our master had real problems using the simple declarative, "No". He seemed to be of several minds regarding his place at the center of all the resulting fuss and kerfuffle, but showed genuine delight when he caught a whiff of fresh clarity in some acolyte's thinking. It was the best of places, it was the worst of places. In 1972, after two intense years I left and, newly married, opened my own shop in Lebanon, NH, later moving across the river to Norwich, VT. These years, my time in the wilderness, were an opportunity to wrestle with the craft, gain insight and amass confidence. The descriptions contained in the offering sheets for our custom instruments (available as .pdf downloads from the links on the pages that follow) have been written both to outline the histories and contexts of each type as well as to answer the most usual practical queries. If you have any further questions, I would be delighted to answer them. Please feel free to contact me at finfo@hubharp.com.